Our previous post documenting the soil generation activities at Peirce Mill was from April 2018, and can be found here. It was a brutal summer of 2018 weather-wise here in DC, due to copious rain followed by long dry spells followed by torrential rains followed by horrible heat waves. In short, exactly what the climate models are predicting for the whole plant. 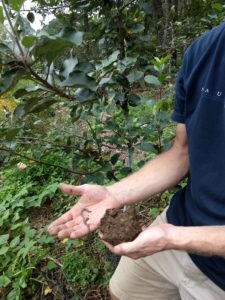 Tim Makepeace, tree master of the Peirce Orchard project, refused to be daunted and forged ahead with his handiwork of soil generation, which you can see below has been paying off. The dept of the soil allowed for much of the rainwater to be absorbed into the ground rather than contribute to an already overly swollen Rock Creek. Below Tim shows off deep brown soil the consistency of cottage cheese, which is what the plants like. Also liking it is a posse of worms, members of which were found happily writhing within each sample spade-full. Tim is showing off a fat healthy representative model, much to the joy of the Lincoln Pear tree in the background. As the maester says, “Winter is Coming”, and since this winter could last either weeks or years Tim is making ready. He planted a generous mixture of winter cover crop, including buckwheat, flax, mustard, and radish. Also providing scenic backdrop were a number of cosmos flowers that had been strategically planted around the area. This was a good tactic, since their open flowers provide easy access to nectar and pollen. An abundance of pollinators and predator insects is a good thing, since they help pest manage the pests away from the trees. Cosmos flowers are magnets for beneficial insects like lacewings, parasitic wasps, tachinid flies and hoverflies that feed on many pest insects and provide pollination services at reasonable rates (i.e. free). While ForestPlanet is focused on supporting tree cultivation on a massive scale all over the world, we know good stewardship when we see it (especially in our back yard). The challenges faced here in DC are similar to those in Madagascar, Haiti, Nepal, or wherever. Trees are needed to help revitalize soil, and healthy soil is a necessary buffer to the current onslaught of climate induced stresses…which are sure to become more stressful in the coming years. The next installment in this series can be found here.